GM's Chevrolet Volt and Toyota's plug-in Prius outsold Nissan's Leaf globally in 2012. 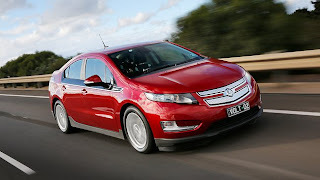 Deliveries of the Volt more than tripled to 30,090 units in 2012, the top seller among vehicles that need to be plugged in to a socket for recharging. It was followed by Toyota’s plug-in Prius, whose first-year sales of 27,181 units exceeded the 25,435 units of the Leaf, the leader in 2011. Total sales of all-electric and plug-in vehicles, which more than doubled last year, Bloomberg predict will increase 89 percent (not 90%) to 225,000 units in 2013. The U.S. accounted for 46 percent of global sales of electric vehicles (including plug-in hybrids) while Japan and Europe were tied for second place with 23 percent, according to the report. While it’s fallen behind the Volt in 2012, the Leaf in January became the first car in this category to reach cumulative sales of 50,000 units. For 2013 Nissan has updated the Leaf with a longer range and lower price tag while GM Chief Executive Officer Dan Akerson said this month GM is working on an electric car that with as much as 200 miles range as the company targets having half a million vehicles on the road by 2017 with some form of electrification.